Du möchtest mitorganisieren? Wir, die noch sehr flexible FemWo 2019 Orga-Gruppe aus Basel, sind noch mitten in den Startlöchern. Wenn du bei der Organisation (jetzt oder später) mithelfen möchtest, dann komm gerne an eines der nächsten Orga-Treffen (Do, 4. April, Mo 29. April, Do 23. Mai, Di 11. Juni, Do 4. Juli jeweils 19.00 im Sp!t, Erlenstr. 44, 4058 Basel) oder kontaktiere uns jederzeit per Email: femwo@immerda.ch. Tu aimerais participer à l’organisation du FemWo? Nous sommes un groupe encore très flexible et ouvert à Bâle. Si tu veux te joindre à nous maintenant ou par la suite, ce sera un plaisir de te rencontrer à l’une de nos prochainesréunions (jeudi 4.4 Do, 4. avril /lundi 29. avril /jeudi 23. Mai/ mardi 11. Juin/ jeudi 4. juillet 2019, 19h à Sp!t, Erlenstrasse 44, 4058 Bâle). Tu peux aussi nous contacter par email: femwo@immerda.ch. We are happy to inform you that the annual FemWo will take place this year from the 22. to 25. of august 2019 in the area of Basel. We are kindling inviting you and are looking forward for inspiering encounters and exciting exchanges with all of you! This year we want to create an open space to develop feminist ideas and create networks. There will be theoretical and practical workshops, discussions and also space for spontaneous ideas. 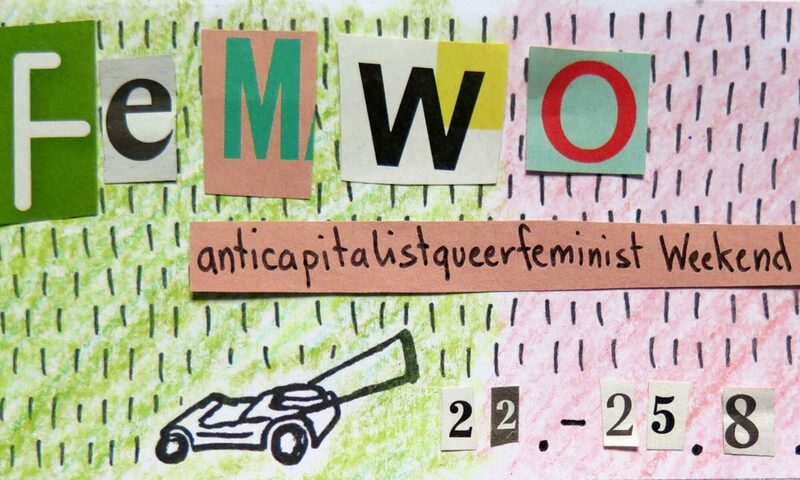 The FemWo will would like to facilitat the connection of queerfeminist, anticapitalistic and antiracist fights and has a intersectional approach. Open for all women*Lesbian* Trans*Inter*Genderqueer* people. Cis-Man are asked to solitarily not attend the weekend. Do you want to take part in the organisational commitee? FemWo Organisation commite from Basel is just starting. If you want to help (now or later) you are warmly invited to join one of our next open meetings (Thursday, 4. April/ monday 29. April/ Thursday 23. Mai/ Tuesday 11. Juni/Thursday 4. July always at 19.00 in Spl!t, Erlenstrasse 44, 4058 Basel) or contact us through Email: femwo@immerda.ch.